No excuses for skipping breakfast! 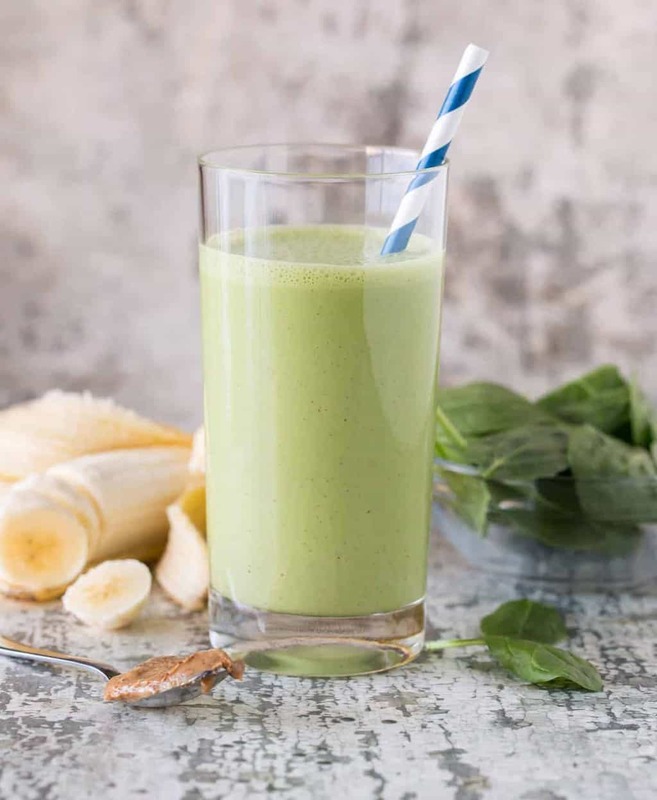 This healthy Easy Banana Spinach Protein Smoothie recipe takes minutes to make and will keep you full until lunch. It’s a great option to refuel post-workout, too! Breakfast is my favorite meal of the day, but I’m definitely guilty of grab-and-go convenience when mornings are rushed. Which is why I love this Easy Banana Spinach Protein Smoothie recipe. Not only is it the best protein shake recipe (in my opinion), it couldn’t be easier to make and can even be frozen ahead of time to make healthy eating a snap. Why put Protein Powder in Smoothies? Adding protein powder to smoothies is an easy way to increase your protein intake during the day. I always feel fuller longer when I add more protein to my diet. 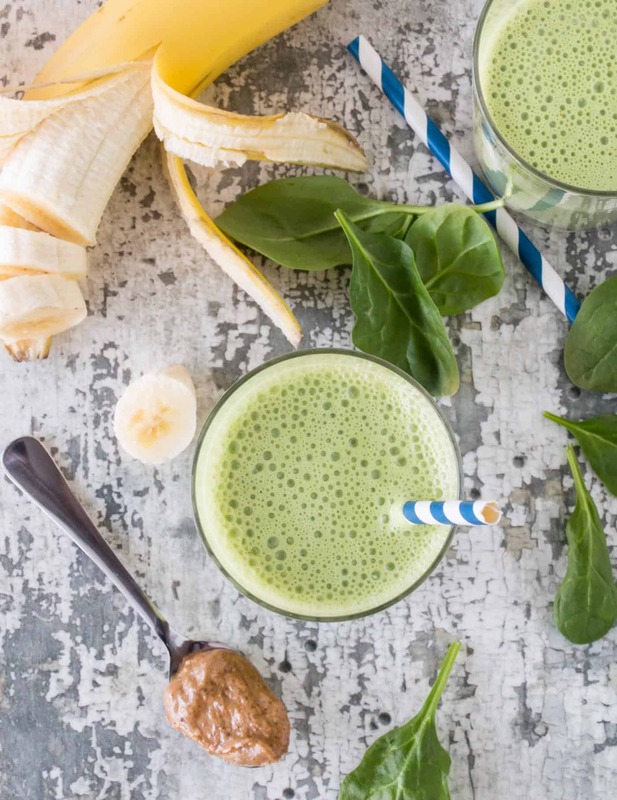 This Easy Banana Spinach Protein Smoothie recipe includes protein powder PLUS protein-rich Greek yogurt and almond butter for a triple punch of protein goodness. Can Green Smoothies Taste Good? Absolutely! Even my kids love this spinach and protein smoothie recipe. Why? Because you can’t taste the spinach! Seriously. 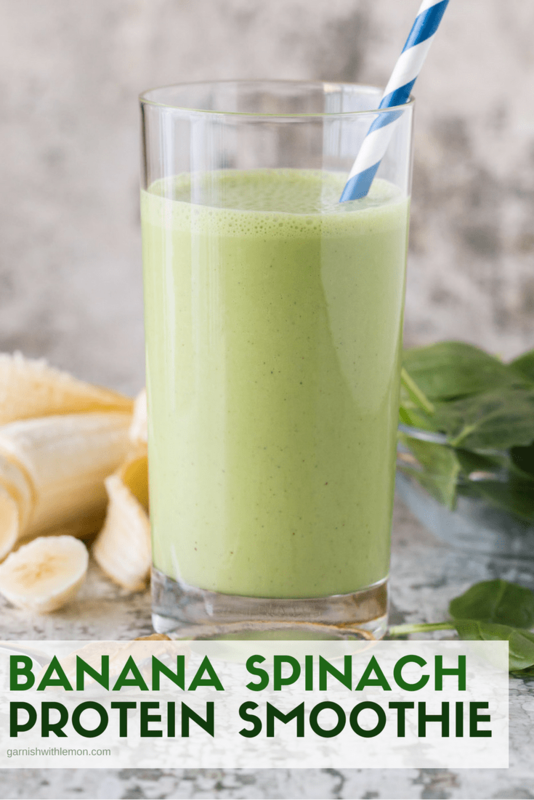 Personally I love spinach in any form, but the flavors of banana, yogurt and almond butter are what shine in this simple protein smoothie. So feel free to be generous with your handful of nutrient-rich spinach in this gorgeous green smoothie. 2. You can actually freeze individual portions of ingredients for this Easy Banana Spinach Protein Smoothie in zip top bags. Portion out your Greek yogurt in ice cube trays and freeze. You can do the same with almond butter if you don’t keep it on hand normally. Add a couple cubes of frozen yogurt to a zip top bag along with your banana, almond butter (if frozen) and spinach (YES, you can freeze spinach for smoothies!). When you’re ready to make your smoothie, grab a pre-made bag from the freezer and dump it in the blender along with your remaining ingredients and enjoy a freshly made smoothie in no time flat! 1. A good blender. Now I know not everyone can splurge on a top-tier blender, but I highly suggest you save up your birthday gift cards because they make a huge difference in how quickly you can pull together one of these green smoothie beauties. I own Blendtec and love it, but many people are also thrilled with their Vitamix blenders. They do a much better job of tackling rock hard items like ice and frozen yogurt cubes and are able to decimate that spinach into microscopic pieces (which is key when you’re trying to convince a non-green smoothie person to try a green smoothie). 2. These measuring cups are awesome because they are magnetic and stick together. No more lost measuring cups! 3. This vanilla protein powder is our current favorite. We’ve tried a number of them but keep coming back to this one. It’s organic, too! Hosting a group for brunch? Serve a round of these adorable Cherry Almond Smoothie Shooters. Add a shot of caffeine to your morning smoothie with this Easy Coffee Smoothie Recipe. Spring berries are coming! Enjoy them in this Strawberry Mango Protein Smoothie. Fiber-rich oatmeal is a fantastic add-in to this tasty Blueberry Oatmeal Smoothie. Dessert for breakfast? Yes you can with this Pumpkin Pie Protein Smoothie recipe! Add all ingredients to blender and puree to desired consistency. Thanks for posting! I am going to try a big batch and freeze. I love breakfast but am terrible at eating something healthy and substantial when I have to get Jackson to school and therapy in the morning. What kind of containers do you freeze them in?? We use round tupperware-like containers with lids. Pat usually dumps his in a large mug when he gets to work. Just remember to defrost them the night before! I am into smoothies these days–trying to get healthy for the New Year! I keep eyeing up these green smoothies, so I might just have to try this out. Try it and let us know what you think! I promise, you can’t taste the spinach. Pure goodness! A – I’m looking forward to trying this out to liven up my ho-hum breakfasts – will let you know what I think! Hi from The Netherlands! This smoothie I really would like to try. One question though, I do not have protein powder (I am not on a diet to loose weight). Is there a natural ingredient that I could replace it with? Or can I simly leave it out? Hi Nelleke, So glad you found our blog! You can leave out the protein powder, but I suggest adding some vanilla-flavored greek yogurt and/or honey to keep the taste similar to the original recipe. Enjoy! I love eating healthy… I’m trying this smoothie tomorrow! Thank you Pinterest, lol. OMG my mouth is watering just looking at that picture. I whipped up a smoothie when I got home and it was amazing! Hi Rachelle, you can simply omit the almond butter if you don’t have it. Another alternative is to use peanut butter or any other nut butter. I just tried this smoothie and it was delicious! I’ve been trying to experiment with throwing in my own ingredients and they always turn out terrible! I’ve been wanting smoothies that have spinach, but that don’t taste terrible and this one was perfect!!! thank you so much! Do you have any other smoothie recipes with spinach or high protein??? Hi Rochelle, I don’t have any other high-protein recipes to share, but you can certainly adapt this one to use different fruits and/or spinach. I also suggest checking us out on Pinterest. We have a board dedicated solely to smoothies with some excellent options from other talented bloggers. Good luck! Just found your blog, garnish with lemon…wonderful…trying the Spinach banana smoothie in the morning…can’t wait…plan to try many of the recipes found there..thank you. Is the almond butter just for flavor?? Going to try these this week. I know the kids will eat them but I won’t tell them there is spinach in them!!! Hi Karen, we use almond butter because my daughter is allergic to peanuts, but you can certainly sub in peanut butter, if you prefer. It adds a bit of thickness to the smoothie as well as some additional protein. Hope it goes over well with your kids! I just made this smoothie, however, I substituted the almond butter with raw coconut butter (note I say butter, not coconut oil), and instead of the Greek yogurt, I used 2/3 cup vanilla-flavored almond milk, only because my protein powder is plain and one scoop of it offers 25g of protein already. I’m thinking next time I make it, I will see what it tastes like to add some cucumber and/or celery and maybe a handful of frozen blueberries! Glad you found a way to make it perfect for you, Angela! What if I have unflavored protein powder, can I add vanilla extract for flavor ? You can do that, Vanessa. Or you can also swap in vanilla Greek yogurt if you have that handy. Or just use the plain protein powder you have. I was curious if when you are preparing these to store in the freezer, do you include the water and the protein powder and the almond butter? Or do you add those when you’re ready to blend everything together? Hi Alma, I typically freeze the banana and spinach together and then add the remaining ingredients together when I blend them together. You can also prepare the smoothies entirely and simply freeze individual portions if that works better for you. Enjoy! So glad you enjoyed it, Nicole! Loved the taste and easy to make. Tried it for lunch though after my work out. Feel full and great.